The chest armor provides torso protection. It may improve health, defense, critical chance and speed but the chest armor is more capable of improving one's health and defense. The Dust Devil Armor provides the greatest increase in speed of movement and is beneficial in coop multiplayer for one to run and gun. You should go for the Behemoth first. Having a nice weapon is more important than having good armor. You can grind crystals faster with that weapon too. 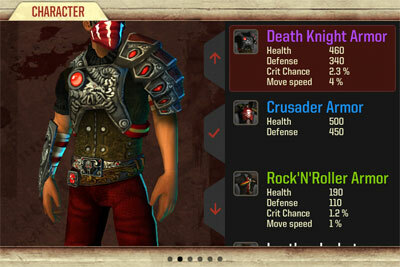 In singleplayer campaign, it is better to use a chest armor that comes with high health and defense. But considering the cost, the Dust Devil Armor gives a good balance of improvement that is useful for the coop multiplayer in the long run. You can compensate for the reduced health by leveling up, avoiding hits and using more Medipacks while in the campaign.